About seven weeks ago, I received a friend request via Facebook. I’m sent quite a few of these as the Town Crier of Glastonbury. I get them from people all over the world. Perhaps they have seen me “Crying” in Glastonbury, or maybe we’ve chatted in the street or in some cases, they simply wish to have some sort of connection with Glastonbury, through me. It’s all rather lovely, really. This particular friend request was from a young lady called Kelly, who lives in Scotland. She explained in our first exchange, that she was a student photographer, carrying out an extensive photographic project on Glastonbury and Glastonbury folk. Apparently, the project was one of her submissions for her University degree. She asked if she could take a few photos of me in my regalia. This is Kelly with her husband. As you can see, Kelly also likes dressing up! I responded positively, naturally. I’m always glad to help people progress in their education. After all, I’ve spent a very successful career doing exactly that! She said that she was planning to fly down from Scotland in mid-March. During our ongoing exchange of messages, I suggested that she might also like to photograph “Billy The Celt”, the current Bard of Glastonbury, who also has a particularly fetching regalia. She liked the sound of that and after asking round a few friends, I soon had his contact details. 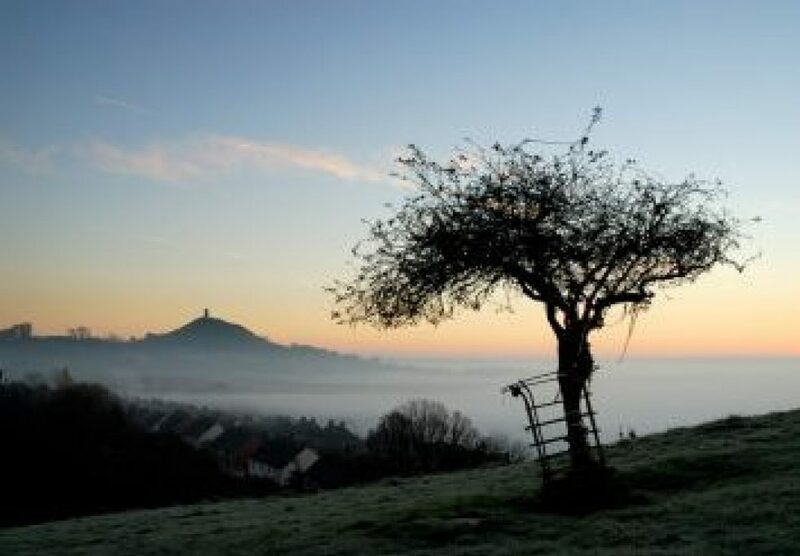 Within what seemed like no time at all, Kelly was on a plane heading south to Bristol Airport and on to Glastonbury for her 4th visit to our lovely, magical town. Once here, Kelly managed to bump into our Chaired Bard; she also managed to grab a few photos of him. Synchronicity abounds in this town! Our photoshoot was arranged for a Sunday lunchtime. We were to meet outside the George and Pilgrims Hotel in Glastonbury. The place is full of atmosphere and character, with its stone floors, murals and dark wood. Being built in the 1400s, it was the perfect backdrop for photos of a traditional Town Crier. I was busy “Crying” in town for a Cancer Research UK Charity Shop Bake Sale the day before. Kelly, who was on her photographic mission there, happened to hear me and came up to introduce herself. We had a brief chat about what she wanted to do the next day. Her plan of action was to take some photographs of the local Town Crier appearing to “take a break with a little beverage, in a local hostelry” and then a few “in action” outside on the streets. On the Sunday, I presented myself in full attire, at the allotted time, outside of the George and Pilgrims Hotel. I decided to bring along my hunting horn, as an extra prop – I do use it for certain types of jobs in Glastonbury – I thought it might make an interesting snap or two. Kelly was running a little late on her busy photographic schedule. She had just been to photograph the Mayor, directly before me. So, there I was, standing in the High Street in the bright, blazing sunshine ..…… patiently waiting. I felt rather conspicuous. I know it’s strange for me to say that. The whole idea of a Town Crier’s outfit IS to be conspicuous and attract the attention of the public! But it felt a little strange since I had no cry written down, since today was going to be all about photography. Understandably, people looked at me quizzically, expecting me to ring my bell aloft at any moment, followed by a bellowed proclamation. So just for the hell of it, whilst waiting for Kelly, I decided to go into “Statue Mode”. I do this sometimes, for example, when I need to give my voice a rest. It causes no end of amusement to the passing public; I really should put a tray down on the pavement in front of me during the busy tourist season and raise money for charity! Just at that point, Kelly arrived, rather flushed and slightly breathless, apologising profusely for her lateness. I reassured her that that it was not the slightest problem and that I was just having a little fun being a “Town Crier Statue”! We adjourned to the bar. Kelly thought that she would get some good indoor shots with “His Lordship” sat in the bay window with the sunlight streaming in through a particularly beautiful stained-glass window. Perfect! I was treated to a cider and we sat down to discuss her photographic plan of action. It’s not every day I get bought cider by a charming and pretty young lady! A perk of the job, I guess. In what seemed like no time at all, Kelly was on her feet, busy arranging me and all of my tools of the trade in total absorption, with a look of utter determination on her face. She was a joy to watch as she crafted every single photograph. Her work caused much amusement to the various assembled drinkers. Several couples, busy tucking into their Sunday lunches, suddenly found the unexpected and quite novel lunchtime “entertainment” an interesting talking point. Some even “piggybacked” Kelly’s carefully arranged shots by taking photographs of their own over her shoulders, on numerous cameras and mobile phones! I suddenly knew how Marilyn Monroe must have felt! I was photographed enjoying my cider………reading my scroll, enjoying my cider……… writing on my scroll, enjoying my cider……..looking wistfully into space , enjoying my cider……..smiling, enjoying my cider…….. deep in thought, enjoying my cider – every time, with the label on the glass being carefully concealed. Kelly’s attention to every little detail certainly was impressive! Then, after a quick change of seats, another sequence of photographs, this time with the props, and myself, all being carefully arranged around an EMPTY glass. Are you following the “story” so far? 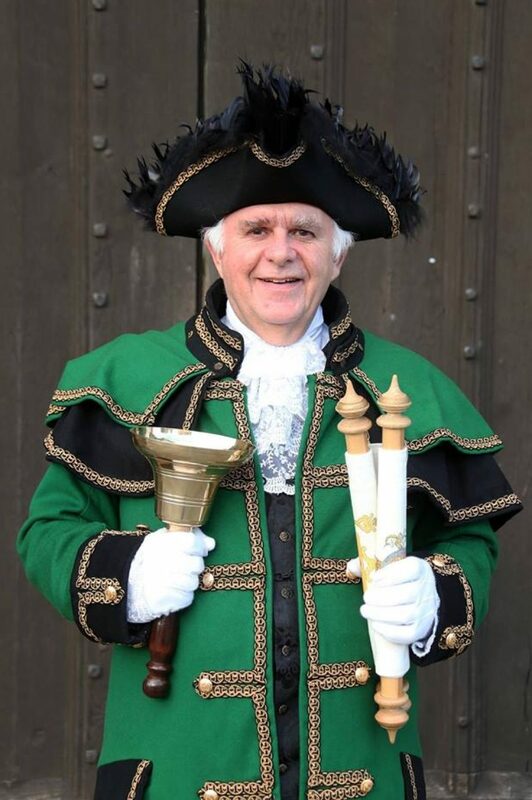 Town Crier of Glastonbury’s Bell, Tricorn, white gloves…….with sadly, an empty glass! While we still had the light, we proceeded outside for more pictures of me “doing my thing”. A quick change of lens and some guidance on the best backgrounds for her shots (Town Criers know all about these sorts of things!) and we were shooting again. At the Market Cross – a favourite and symbolic spot for me, there were endless shots of bells held up in the air, horns being blown and a Town Crier with his mouth wide open, catching flies! As you can see from the excellent photographs that illustrate this blog post, Kelly is a photographer of quite exceptional talent and I’m sure her university photographic assignment will pass with flying colours. I know I’m biased but I’d give her a First-class Honours degree based on these pictures alone! She’s on Facebook: Kelly Muir Photography. Check her out! I can’t recommend her highly enough! Just then, a couple came by and asked for a photo, which was seamlessly slipped in somewhere during the proceedings. It transpired that it was the gentleman’s birthday, so of course, he simply had to have a special Birthday Cry. As a town crier, I love these little impromptu moments. He looked quite happy in the photograph, his special day in Glastonbury having been acknowledged, in a very personal way, with a Birthday Cry from The Town Crier. Finally, just as we were finishing, a charming and immaculately-dressed young lady who was visiting from Hong Kong, requested a photograph. If I had still been thinking straight after all that posing, I would have given her an Official “Cry of Welcome” since she had flown half-way round the planet to visit our wonderful little town. However, in subsequent digital correspondence with her, it appears that she is planning to return to Glastonbury for one of our colourful festivals later on in the year – so we’re treating her special “Cry” as having a brief postponement. Still …….… she did get to hold my bell!